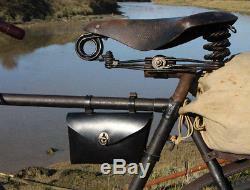 A most interesting new model is a well-designed military bicycle enamelled all over in black or service colour. This machine is fitted with service gun clips, and with special carriers back and front which have been subjected to severe weight-carrying tests, each is capable of supporting an average man. It is a utility machine which seems assured of much favour during the next few years. Cycling Magazine, Page 448; 3rd December, 1914. 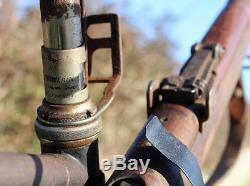 Europe exploded into war in August 1914 and the immediate effect of this was to give Raleigh sales a great boost. By September the government had ordered several thousand bicycles from Nottingham and a great many motorists had decided to return to the bicycle, the most economical means of transportation during the crisis. Inevitably the war brought some new problems, such as manpower. Printed this report in October. 250 men from the Raleigh Cycle Works have either been called up or volunteered for active service, a result of which shows the patriotic spirit prevailing. The Messrs Bowden, the proprietors of the Raleigh Cycle Co, have always encouraged patriotism amongst their employees. The Company is making the same allowance as the War Office to all the dependents of all employees who have been called up. But in spite of losing men, the company responded to the war situation by immediately bringing out some special new models. All these were in great demand and their durability was greatly praised. A member of the 10th Royal Hussars wrote to the company soon after the outbreak of war saying. The roads are very much cut up with heavy transport but the Raleigh sticks it like a true Briton I have been over the worst country out here, very often over fields, but my bicycle has never yet dodged its duty. Inevitably, bicycle production had to be substantially reduced to cope with munitions work although the total number of employees by the end of 1915 had risen to over 2000. Most of the new workers were women, something of an innovation in the cycle industry. In order to make the bicycle side as efficient as possible it was decided to concentrate on the most popular models and drop the rest from the list. The war produced scares and rumours of all sorts and one such rumour which was quite widespread in the winter of 1916 was that Raleighs might have to give up bicycle manufacture altogether in 1917. Harold Bowden lost no time in sending out a circular to all agents saying that unless something unforeseen and totally unexpected was to happen, deliveries for 1917 would be just as reliable as they had been in 1916. In fact the bicycle side never even came close to being shut down during the war and to make up for the absence of the annual Cycle Show, which inevitably had to be abandoned for the duration, Raleighs began to put on special displays at their London showrooms to serve the same purpose. 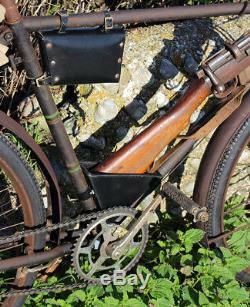 Very few bicycles have proven provenance as a World War 1 military model, and even fewer can be shown to have definitely seen action during the war. 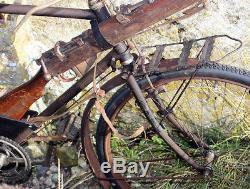 The reason is that most'military' bicycles were normal roadsters with military fittings added by the factory, by the corps, or by servicemen themselves. A serviceman often used his own machine. Records exist to show the age of Raleigh bicycles, so it can be seen that this example was made during the War. As you can see by comparing the illustrations above and below, Raleigh's'Military Model' would appear to be a Model No 28 with the addition of rifle clips and a carrier rack front and rear. 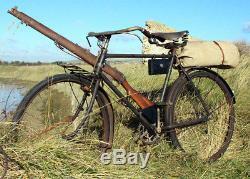 1917 Raleigh Military Model with Rifle Mounts. 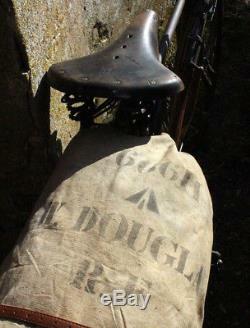 Brooks B90/3 Saddle (with Raleigh Script). (appears to have been owned by William Douglas of the Royal Fusiliers). READY TO RIDE & DISPLAY. 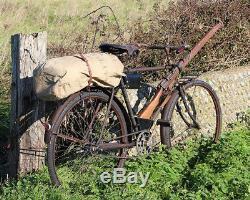 This 1917 Raleigh All-Steel Roadster was found in France where it had spent the past 100 years. It retains an identification tag on the handlebar stem showing the name of its previous owner in Bordeaux, France. I added the appropriate fittings to turn it into a Raleigh Military Model, as illustrated below. The machine is in sound all original condition, unrestored cosmetically, with the remains of some of its original paintwork and box lining. It's ready to ride and display. 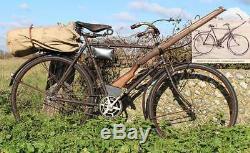 WORLD WAR 1 MILITARY RALEIGH BICYCLE IMAGES. 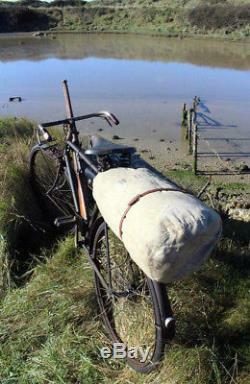 The photo below shows the way a bicycle might have been concealed for coastline look-out duty. Normally, two look-outs were stationed in appropriate locations. In the event of an enemy landing, they would not challenge the invaders, but one would keep watch while the other would use his bicycle to alert the authorities. So a bicycle would be concealed ready to head inland. I also have a few sets of rifle clips available for sale on their own. 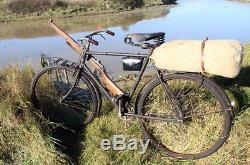 If you want to convert your own bicycle into a military model. I think most of you know how I operate by now. I try my best to provide a friendly professional service, with good condition vehicles. Original literature is available to download for free from the website. OWNER: The Online Bicycle Museum. 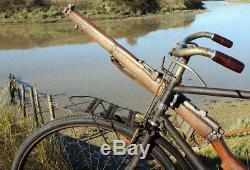 The item "1917 Raleigh'Military Model' WW1 Vintage Antique Army ANZAC Great War Bicycle" is in sale since Wednesday, November 01, 2017. 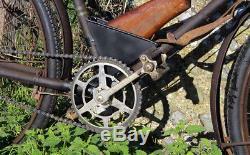 This item is in the category "Collectables\Transportation Collectables\Bicycle\Raleigh". The seller is "groovydubber" and is located in Brighton. This item can be shipped worldwide.